Would you like to get a closer look at the daily business of the Indian women? 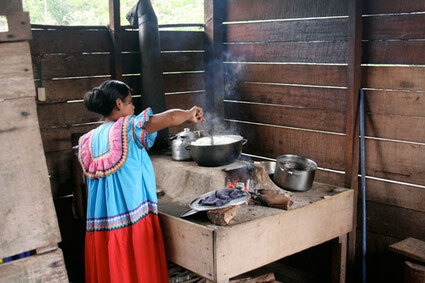 Learn the art of cooking on an open fire; try to sew a Guaymie costume or to do some manual work with natural materials is interesting as well. You can also find out about your own manual skills, for example by trying to handle Agave leaves or to spin a thread. First of all the fibres will be coloured. Afterwards the thread isn't done by using a spinning wheel, but by twisting the raw material on your lower leg. Then they knot beautiful bags out of these ropes. The making of the holders is particularly special and worth a try. In the Guaymie culture there are known three types of fibres.